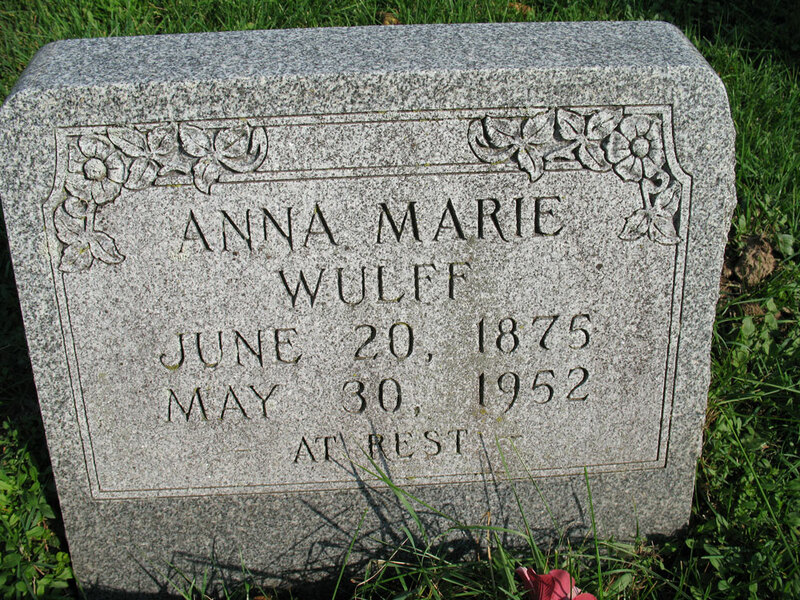 Anna Marie Wulff was the sister of my great-great grandmother Carolina “Lena” Sophia (Wulff) Bohnsack. She was born on June 20, 1875, in Mecklenburg, Germany, to Henry John Wulff Sr and Maria Sophia Schumacher. The family immigrated to the United states about 1883. Besides Lena, Anna’s other sibling was Henry Jr. Anna was the youngest of the three. Anna never married. Anna died on May 30, 1952, in Hazel Green, Grant County, Wisconsin. Interment made in Schapville, Jo Daviess County, Illinois, at Shepherd of the Hills Cemetery. 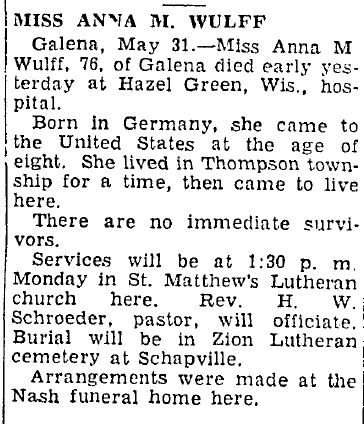 Anna’s obituary was published in the Freeport Journal-Standard on May 31, 1952. Galena, May 31 – Miss Anna M. Wulff, 76, of Galena died early yesterday at Hazel Green, Wis., hospital. Born in Germany, she came to the United States at the age of eight. She lived in Thompson township for a time, then came to live here. Services will be at 1:30 p.m. Monday in St. Matthew’s Lutheran church here. Rev. H.W. Schroeder pastor, will officiate. Burial will be in Zion Lutheran cemetery at Schapville. Arrangements were made at the Nash funeral home here.